MR spectroscopy combines standard MRI images with tests of the chemical reactions inside tumors. Doctors are now able to use a type of scan called MR spectroscopy to study genetic abnormalities in brain tumors. In some cases this noninvasive technique allows patients to avoid invasive brain biopsies while still enabling them to enroll in clinical trials of drugs that target specific mutations in their tumors. MR spectroscopy uses an MRI machine to look at the composition of molecules in a tumor. About 80 percent of low-grade glioma brain tumors have a mutation in a metabolic enzyme called IDH. IDH-mutant cancers produce a compound called 2HG that can be measured with MR spectroscopy. MSK has several clinical trials for drugs that target mutated IDH. 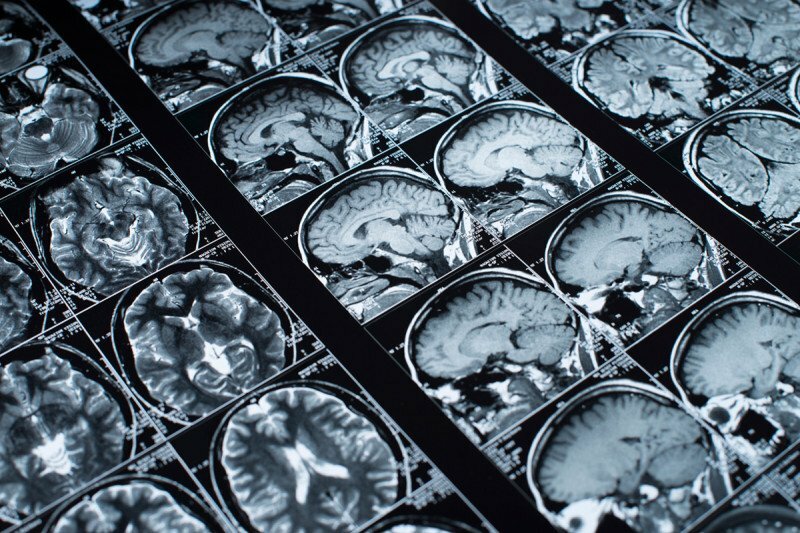 An imaging technology called MR spectroscopy is allowing doctors to diagnose brain tumors without putting patients through the rigors of a brain biopsy. These noninvasive scans can identify molecules associated with the genetic mutations known to drive cancers, opening up personalized treatment options for patients based on their tumor’s molecular characteristics. They can also be used to monitor patients who may not need immediate treatment. 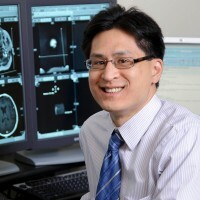 One cancer for which the imaging technique has shown particular promise is low-grade glioma, a common type of brain tumor in young adults. Around 80 percent of these tumors have a mutation in a metabolic enzyme called isocitrate dehydrogenase (IDH). (Research conducted at MSK and elsewhere over the past several years has shown how IDH mutations might lead to cancer.) These so-called IDH-mutant cancers produce a compound called 2-hydroxyglutarate (2HG) that can be identified and measured by MR spectroscopy. The ability to scan brain tumors regularly may allow some patients to delay treatment. In collaboration with MR physicist Sunitha Thakur and neuro-oncologist Ingo Mellinghoff, Dr. Young has developed MR spectroscopy scans optimized to detect 2HG and integrated these scans into routine clinical MRI brain scans for MSK patients. Patients are able to receive truly precise diagnosis, imaging, and treatment for their tumors. Keeping tabs on 2HG can also guide doctors in making treatment recommendations. Not all low-grade gliomas require treatment, Dr. Young says, so the doctor might perform an initial scan and delay treatment if the tumor is stable, following it over time with additional imaging. And for patients who do require treatment, MR spectroscopy can be used to identify those who would most likely benefit from drugs that work against tumors by targeting IDH mutations. Currently, MSK is participating in early-stage clinical trials of several of these IDH-mutant inhibitors available in basket trials. During active treatment, MR spectroscopy can be used to help determine the efficacy of treatment and guide clinical decision-making. Dr. Young and his colleagues are currently studying whether an increase in 2HG could be used as a sign of tumor progression and are also developing new strategies to improve the sensitivity of the spectroscopy technique. Could this MRI scan also be used for patients with other type of cancers that harbor the idh1 mutation, like intrahepatic cholangiocarcinoma? Charlotte, we forwarded your question to Dr. Young, who responded, “Thank you for your interest. You are correct in that other cancers with the IDH mutation also produce the 2HG oncometabolite. Unfortunately, MRI spectroscopy is only routinely performed in the brain. Researchers at MSK are working on developing MRI spectroscopy for sites outside the brain, but this is not yet clinically available.” Thank you for your comment. My granddaughter has an optic /hypothalamic glioma. She is 7 and has not had a biopsy due to location. Could this be a place to start with her and at least find out If she has the IDH mutation? She has had 2 protocols, been off treatment since Nov. 2016 and the tumor has grown 5 mm since then due to high IGF1 levels. Dear Yvonne, we’re very sorry to hear about your granddaughter’s diagnosis. If your family would like to arrange for her to be seen at MSK, they can call 800-525-2225 or go to https://www.mskcc.org/experience/become-patient/appointment for more information on making an appointment. Thank you for your comment, and best wishes to you and your family. Dear Amy, we’re very sorry to hear about all your granddaughter has been through. We recommend you contact our International Center at international@mskcc.org. They can explain to you what your options are, including arranging to have her records reviewed by someone at MSK. You can go to https://www.mskcc.org/experience/become-patient/international-patients/… for more information. Thank you for your comment and best wishes to you and your family.